When locals on the small Aegean island of Thymaina fall ill, first they turn to their medicine cabinet and volunteers. Then they turn to God. There is no doctor on Thymaina, a barren, wind-swept island in eastern Greece with just 150 residents. Like others in the region, they must travel to a bigger island, or Athens, but in winter the seas are rough and the conditions unforgiving. 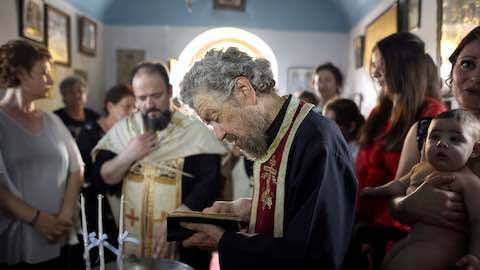 "In winter we count on Saint George," said Dionysia Amorgianou, an 82-year-old woman, pointing to a white-and-blue chapel soaring above the harbor. "We pray that he keeps us healthy because we are neglected here. Isolated." Greece's far-flung islands have long suffered with shortages of doctors and care services, and no relief is in sight after years of economic crisis and austerity. The publicly funded system of free or low-cost health care that millions of Greeks relied on has shrunk, largely because of spending cuts demanded by international lenders in exchange for three financial rescue packages Greece has received since 2010. Islands with fewer than 1,000 residents have not had a permanent doctor in years. "We struggle a lot in winter and we're scared," said Stylianos Markakis, a retired seaman whose 40-year-old son suffers from a rare and progressively debilitating genetic disorder. Locals count the days to summer, when volunteer doctors calling themselves Aegean Team set off from Athens on inflatable speedboats and carry out checks and blood tests on remote islands. On a recent visit, church bells rang out in celebration as the team steered their boats into Thymaina port at dusk. Smoke grenades and firecrackers exploded. They set up examining rooms in an abandoned clinic and people's homes. Makeshift signs directed patients to the cardiologist, the gynecologist, the eye doctor and others. "Here they're second-class citizens," said Nikos Touroutoglou, an oncologist. Years have gone by without a resident general practitioner, creating gaps in treatment. "These gaps cannot be filled with a huge cabinet of drugs," he said. The problems for the next generation are starker. This month emotions ran high at the baptism of Thymaina's first newborn in six years. Couples are putting off having children because even nearby islands lack the infrastructure, said Stefanos Chandakas, a gynecologist leading a team of doctors tackling low birth rates on remote islands. The costs of a routine, 50-euro exam would add up to 1,000 for a woman traveling to Athens, he said. In Thymaina, the team covered the family's costs throughout pregnancy - 10,000 euros ($11,245) - and are now offering their services on 27 islands without a single birth between them in four years. Local governors have offered young doctors incentives, including free food and shelter, to fill island vacancies, but many are reluctant to go. Florentia Christodoulidou, who joined Aegean Team from New York, echoed the sentiment of colleagues in Athens. "Every one of them told me the same thing: If everything goes OK, you are OK. Something goes wrong, it's just you and God," she said. Europe: "Greek Islanders Rely on Volunteers and God"